Seventh victory in a row against Baskonia since the end of last year. This time with a poor hit on the shot, although focused on defense. Randolph, 18 points. Now, there is nothing left to distract from the great goal of each February. Copa Copa en vena, the great Spanish basketball party. 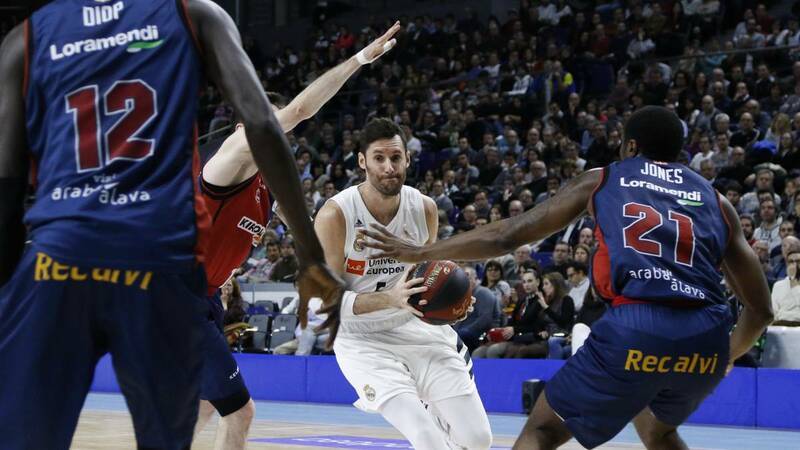 And Madrid will come mixing, almost equal parts, status of favorite and doubts, which dragged by his game and the casualties of Llull (it seems that it will be in the meeting of the KO) and Thompkins (almost discarded). The Whites will be presented as second of the ACB after winning the direct match against Kirolbet Baskonia. Another triumph in the classification and the jump-off in his favor after winning in Vitoria and now in the WiZink Center. In fact, has already knocked down his opponent seven times in a row in eight months, since the end of last year. This time he did it by a narrower margin (82-76), not by the almost 15 average of the three duels previous of the course. Laso won with a low percentage in the shot (8 of 28 out of three), but with a good level behind, closing ranks as a team before the difficulties. The first quarter (15-19) came off and they took the following three . Between the second and the third they fit only 33 points. There, before starting the last act, with Prepelic de base and the team executing game systems that try to relieve him in the task, that does not carry as much ball, Madrid gave the pull to the final dessert: it went from a 49- 50 to a 66-54 in the best moments of Carroll and Rudy. The Mallorcan forward, by the way, went to the dressing room just before the horn with a strong blow to the cheek for a run-in with Poirier. Let's see what remains. Voigtmann and Janning captained the reaction when the finish line was already visible. Insufficient. Madrid was more solid than in previous days, when the Darussafaka came back 15 points in the Euroleague and Unicaja, 21 in the league. Randolph sentenced with a triple from the corner with 18 seconds left (80-73) , it was his fifth of the afternoon (six attempts) for 18 points (11 in the first quarter, his, you know) . The party confirmed what was trend in recent weeks: Madrid is not fine. For that, you do not need the smell of a hound. With or without Llull, Campazzo seems irreplaceable even if Prepelic becomes worth (+11 with him on the track at 12:32). Randolph is the piece inspired by attack, Ayón the glue that brings the perimeter closer to the painting and Tavares goes through a slump, maybe physical, maybe mental, probably unites both. As Deck, somewhat disoriented in the position of three. The white zone is now permeable, and well that the Baskonia noticed, that poked his head where before dared not. The rebound also suffers, but this time, after the review of CSKA and Unicaja in the balls rejected, the Real closed ranks, collective work to compensate for deficiencies. In the Baskonia corroborates the step to the individual front to supply injured and lacking , although perhaps it is not enough to play all the clubs, those of Europe and those of here. Started strong, planting face, and as always before the Madrid of a time to this part, there was a stretch where he limped. It was between the end of the third quarter and the start of the last. Many hands joined this Sunday for the cause of Vitoria, missing, however, an extra, something more. Now comes the Cup, which a year ago resurrected Barça.